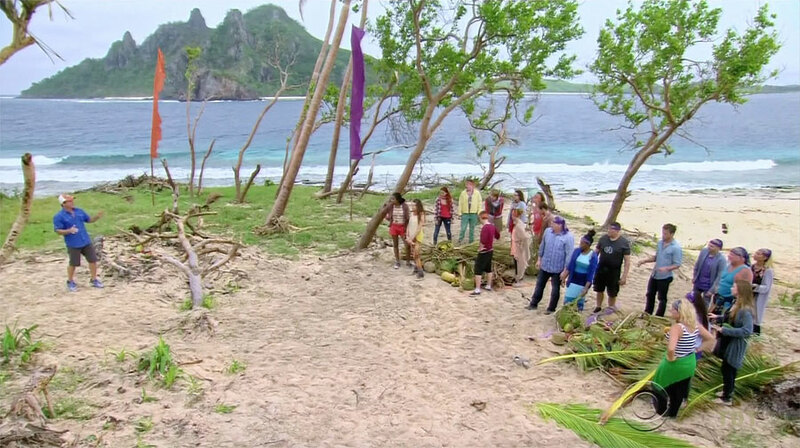 Pre-game Ep1: "May the Best Generation Win" Ep2: "Love Goggles"
All 20 contestants are transported in by boat, then split up by age: Millennials vs. Gen X. Then they have two minutes to race into the jungle and grab supplies they might need. 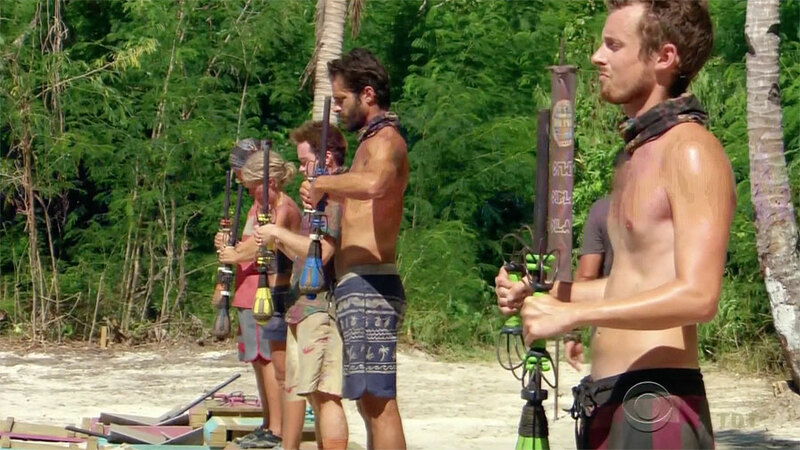 Each tribe must choose one of: Chickens vs. fishing gear. Millennials take chickens, Gen X fishing gear. Jessica finds the Legacy Advantage. Opening scramble for items, Jessica finds advantage. 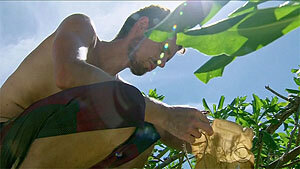 As a cyclone bears down on the Mamanuca Islands (in Fiji), Probst sends each tribe a tarp. Then shows up a few hours later to evacuate both tribes. They spend the night at base camp, with the cameras off, and return the next morning. Cyclone hits, both tribes evacuated. Both tribes must race through a crawl obstacle, retrieving eight war clubs along the way. 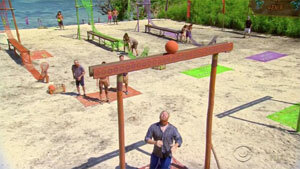 Then they must choose: Go through a rope obstacle, or chop through a mask to make the obstacle easier. (Millenials do it straight, Gen X chooses shortcut.) Then another choice: Cross a balance beam, or chop through a second mask to make the beam wider. 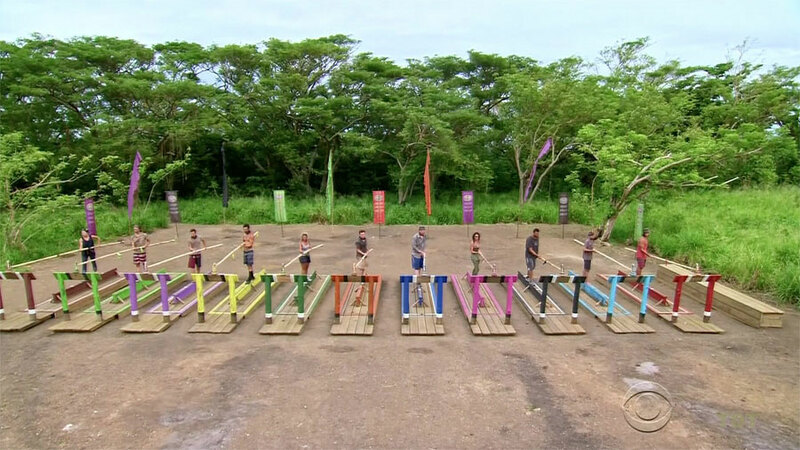 Finally, the tribe must use poles to carry the puzzle crate to the puzzle table, then finish either a 50-piece, 60-piece (1 shortcut taken), or 70-piece (2 shortcuts taken) puzzle. Gen X has an initial lead, puts Rachel and David on the puzzle. As Millennials catch up (with Figgy and Michelle on their puzzle), Sunday and Jessica swap in for Gen X. But it's too late, Millennials win immunity and flint. Ep1 RC/IC: "Got to Choose" - Millennials win. 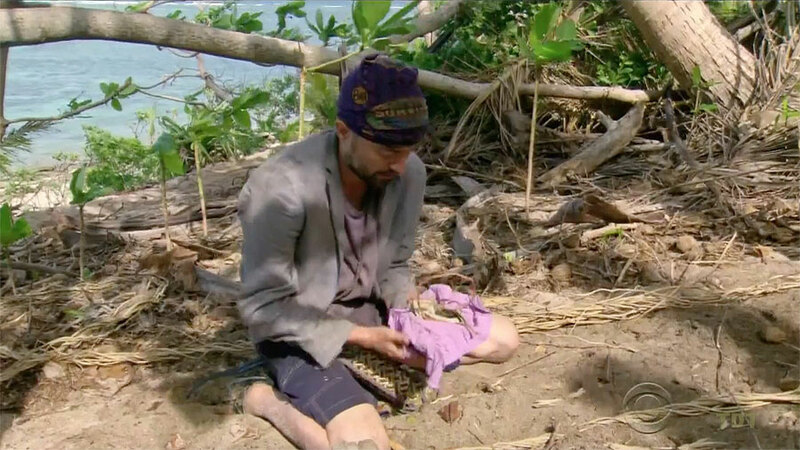 David finds a coconut with a giant purple logo painted on it, sitting feet from the path. Shockingly, it contains an idol. Ep2: "Love Goggles" Ep3: "Your Job Is Recon" Ep4: "Who's the Sucker at the Table?" 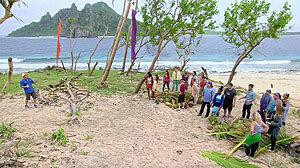 Ep5: "Idol Search Party"
Hannah sits out. 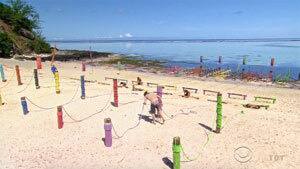 Five people (Chris, Paul, Sunday, David, Jessica; Michelle, Will, Michaela, Zeke, Adam) swim out, climb a net, jump, grab a key, swim and place key on the stand. 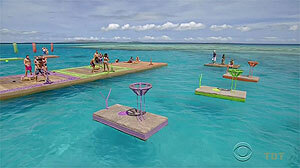 Once all five keys are gathered, remaining four unlock a mask, retrieve five rings tied below the water, then toss those rings onto one of five target poles. All dive for rings. Ring toss scores: CeCe-2, Jay-2, Ken-2, Jay-1, Ken-1. 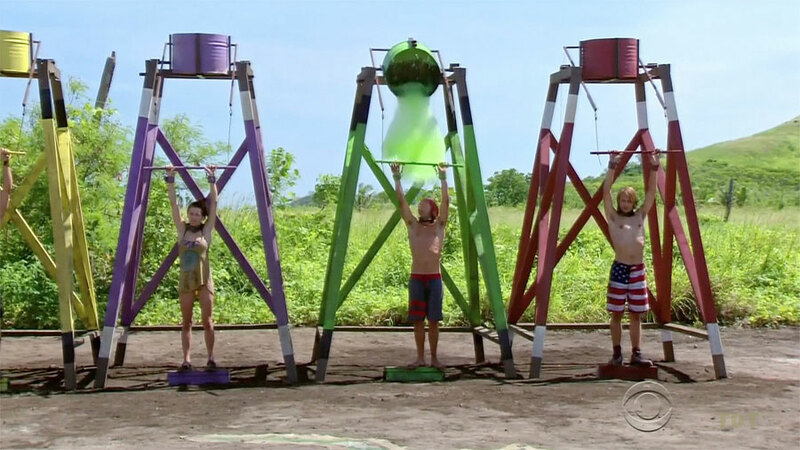 Gen X wins immunity and tarp, 5-3. Ep2 RC/IC: "The Ocean" - Gen X wins. TC2 - Mari voted out (7-3), 18 left. 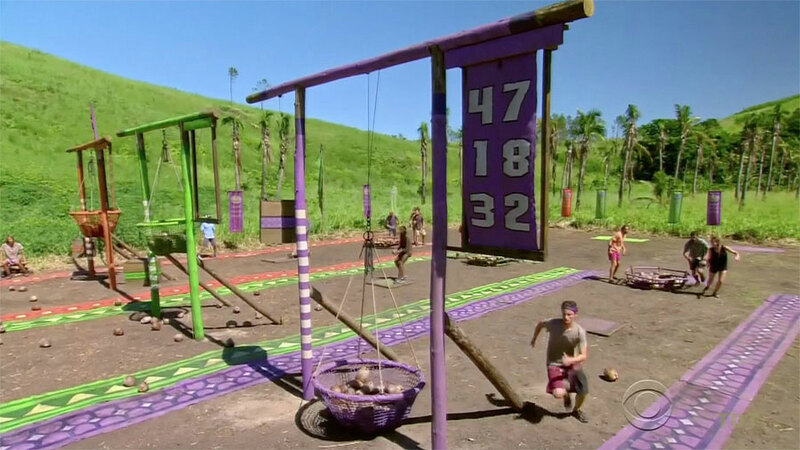 Each tribe is given a bag of rocks in treemail, in which four colored rocks will be used to select four representatives at a 'tribal mixer.' For GenX, CeCe, Chris, David, and Paul attend. For the Millennials, Figgy, Jay, Taylor, and Will go. 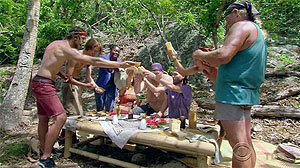 The eight are sent to a separate island by boat, where they eat peanut butter and jelly sandwiches, and talk. That's it. 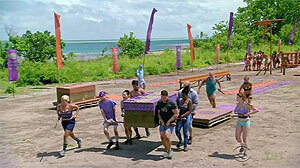 Five people (Adam, Michaela, Will, Figgy, Taylor; Chris, Paul, Bret, Lucy, CeCe) must haul 40-pound sacks of sandbags over obstacles then across a balance beam. Two more people (Ken, Jessica; Jay, Hannah) feed/toss sandbags at a 5x5 block grid/puzzle. 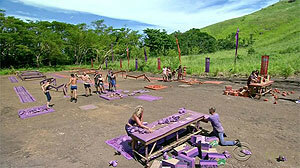 Once all blocks are knocked off, the remaining two (Zeke, Michelle; David, Sunday) must rebuild the puzzle. Millennials take a huge lead on the balance beam, when CeCe slowly crosses with her own bag, while Taylor happily takes Adam's & Will's bags across by himself. Millennials have almost all the blocks knocked off before Ken even starts throwing, and easily finish the puzzle first. Jay tries to trade the reward (comfort items) for fishing gear, but Gen X decides not to allow it. 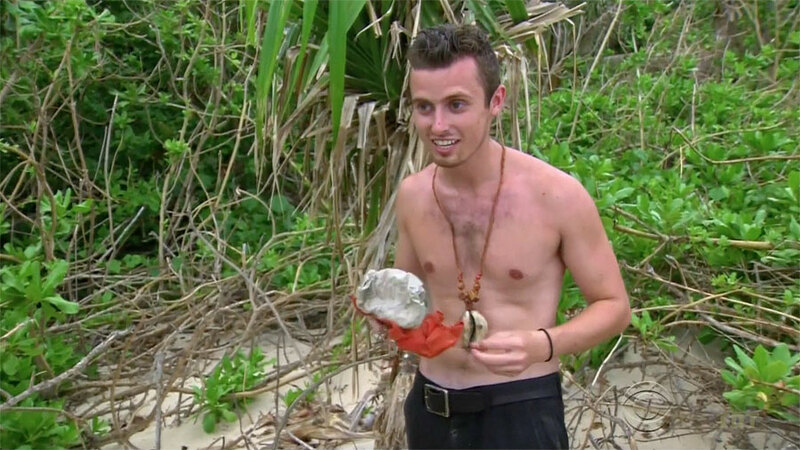 Ep3 RC/IC: "Going Coconuts" - Millennials win. TC3 - Paul voted out (6-3), 17 left. Michelle sits out. As in S26, but with huge waves. First tribe to 3 points wins steaks, sausages, veggies, spices. Rd1: Chris/David vs. Jay/Adam, David scores while Chris holds other two (G-1; M-0). Rd2: Sunday/CeCe vs. Figgy/Michaela, Michaela scores (G-1; M-1). Rd3: Bret/Ken vs. Taylor/Will, Ken scores (G-2; M-1). Rd4: Jessica/Lucy vs. Michaela/Hannah, Michaela scores (G-2; M-2). Rd5: Chris/David vs. Jay/Zeke, Chris scores, Gen X wins (G-3; M-2)! Ep4 RC: "Water Slaughter" - Gen X wins. 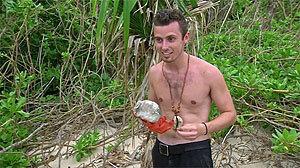 After previously finding the Millennials' idol clue, Adam re-dedicates himself to finding the idol. Which he does, and dedicates to his mom. Ep4 IC: "Angry Chair" - Millennials win. TC4 - Lucy idoled out (-2-1), 16 left. Hours after playing his first one, David joins the Gen X tribe's Idol Search Party, and swiftly finds the second one, hidden in a log. 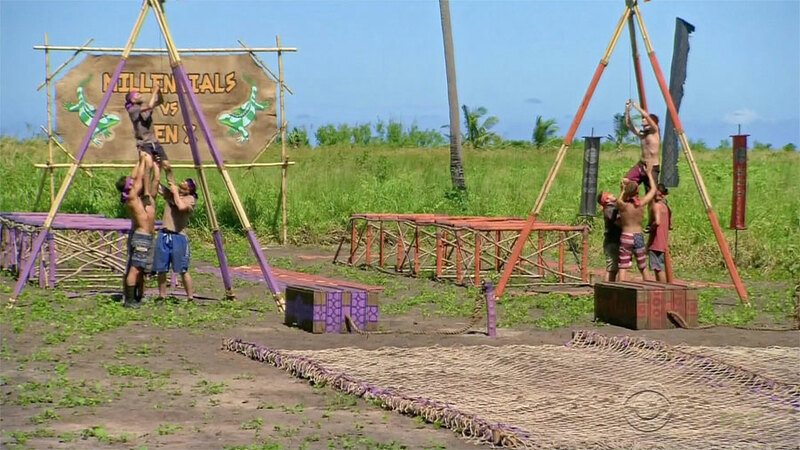 Both tribes are brought to an as-yet unused two-tribe challenge location. 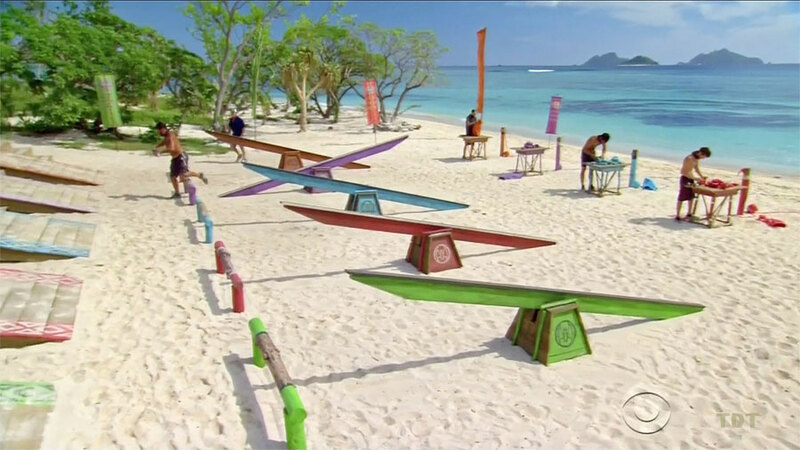 Probst tells them to drop their buffs, and that they'll be swapping into three new tribes: Vanua (orange), Takali (purple), and Ikabula (green). With sixteen players left, there is one extra person, who will go join Ikabula, because they have to build their camp from scratch. 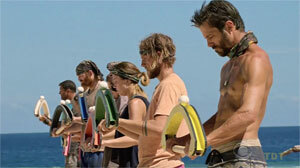 Men and women picks buffs separately, so that each tribe has three men. Tribal swap, third tribe (Ikabula) formed. Ep5: "Idol Search Party" Ep6: "The Truth Works Well" Ep7: "I Will Destroy You"
Will sits out for Ikabula. 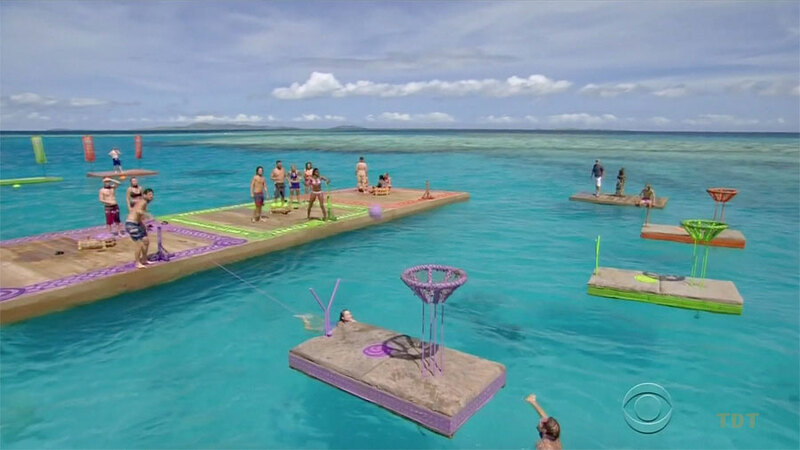 Five contestants must dive, retrieve one of 5 buoys, then either lasso a hook and pull the basket closer, or immediately shoot all 5 buoys into a floating basket. First to sink all five wins, second also safe. Sunday gives up on untying her buoy, so Jay has to go back for it later. CeCe takes forever with hers, David drops his and it rolls of the other side of the dock. Michelle also gives up, Chris goes back for hers. Takali gets all five buoys to the dock before CeCe/David get 2 for Vanua. Ken lassos Takali basket as Jay returns with 5th Ikabula buoy. Michaela lassos Ikabula basket. Michaela sinks all 5 buoys for Ikabula, Ikabula wins! Ken then rapidly sinks the remaining four shots for Takali, before Vanua/Chris even get one in. Ep5 IC: "Holy Diver" - Ikabula wins, Takali second. TC5 - CeCe voted out (4-1), 15 left. Hannah, Bret; Jessica sit out. 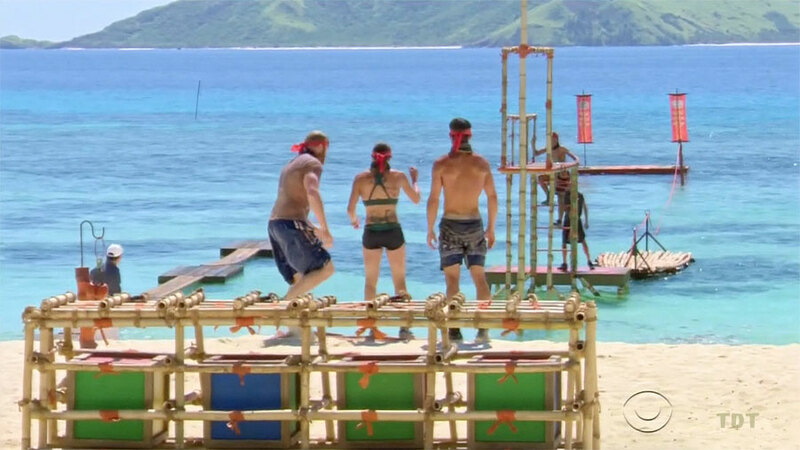 Callers (Jay, Michelle, Figgy) must direct three blindfolded tribemates to collect four pairs of puzzle pieces from an obstacle-strewn course. 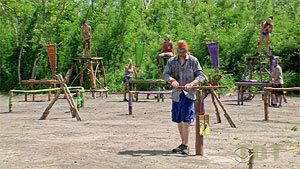 Blindfolded: Chris/David/Zeke; Ken/Taylor/Adam; Sunday/Will/Michaela. Once all puzzle pieces are retrieved, the caller must then direct one still-blindfolded person (Zeke, Michaela, Ken) to complete the puzzle. Despite a Takali lead in collecting the pieces, Vanua wins (a carb-laden pastry and cookies feast), Ikabula is second, wins cookies. 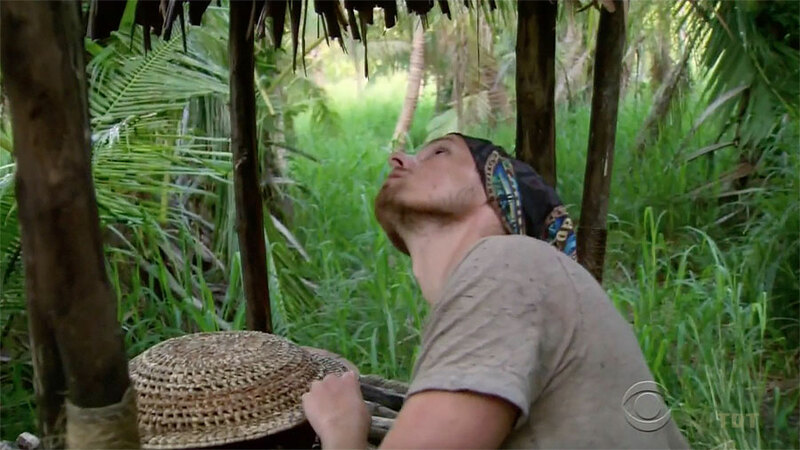 Ep6 RC: "Blind Faith" - Vanua wins, Ikabula second. Sunday, Will; Adam sit out. Two bag collectors (David, Chris; Ken, Taylor; Jay, Bret) must wade out, cross a balance beam, climb a pyramidal tower, untie three heavy bags (each), then haul them in to shore. Once all six are in, they hang them on hooks, and the remaining table maze people (Michaela, Hannah; Jessica, Figgy; Michelle, Zeke) empty the bags, finding three cue balls. They must then roll all three through a table maze to holes at the end. Ikabula wins. Vanua second, barely. Takali loses again. 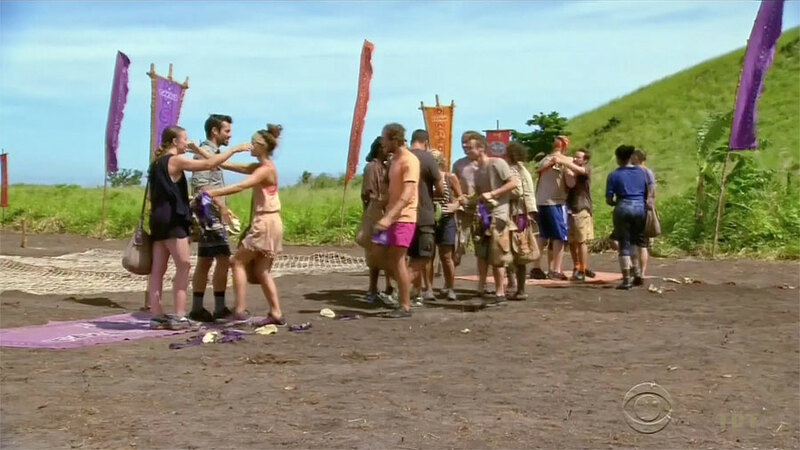 Ep6 IC: "In the Bag" - Ikabula wins, Vanua second. TC6 - Figgy voted out (3-2), 14 left. Bret, Sunday sit out. Each team must unwind a sack of three balls from a long spring, shoot them into a long net tube, with two people moving each ball through by hand, one at a time, then one other person (Chris, Michaela, Ken) must jump up to place them on a gap between two overhead rails. Vanua is first to the final stage. Takali second to get there. Chris wins for Vanua before Ikabula reaches final stage; they get a personal chef come to their camp, cook for them. Ikabula second, get kabobs. Ep7 RC: "Matt Finish" - Vanua wins, Ikabula second. 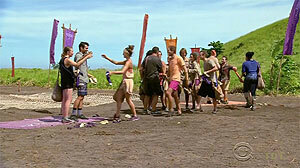 Ep7 IC: "Bail Out" - Takali wins, Vanua second. TC7 - Michaela voted out (4-2), 13 left. Ep8: "I'm the Kingpin" Ep9: "Still Throwin' Punches" Ep10: "Million Dollar Gamble"
Boats arrive at Ikabula and Takali beaches, informing the contestants they have five minutes to gather their supplies. The boats then transport both tribes to Vanua, where for the first time, Survivor merges from three tribes to one in a single step. The new tribe is called Vinaka (not shown). 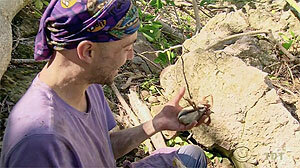 During the merge feast, Adam goes hunting for idols. At treemail, he finds a rolled-up parchment stuck in the roof, which turns out to be a new advantage: He can steal a reward won by someone else at any time. Great. A variant on the "When It Rains" challenge, made slightly more difficult by having both of each contestant's hands tethered to the barrel of paint-infused water. Simple concept: Stand there until you get drenched. Elimination order: 13.Sunday, 12.Chris, 11.Bret (no times shown, very quick). (10min) 10.Jay, 9.Zeke, 8.Ken, 7.Hannah. (20 min) 6.Michelle, 5.Taylor, 4.David, 3.Adam. (1 hr, 30 min) 2.Jessica, 1.Will wins! 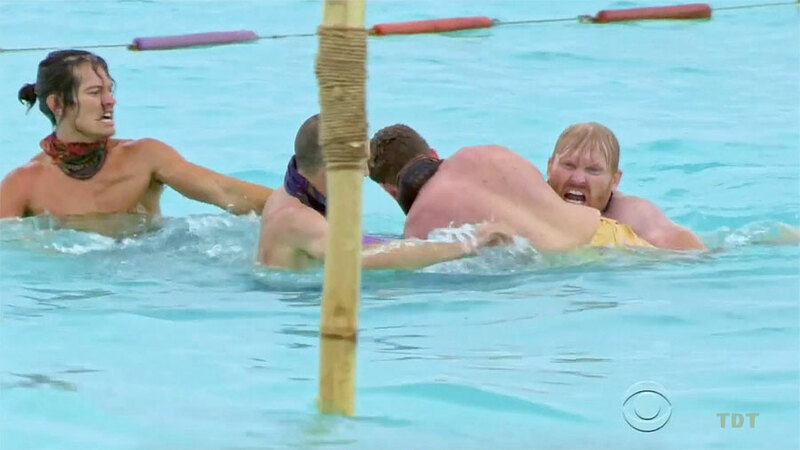 Ep8 IC: "Fools in the Rain" - Will wins. TC8 - Michelle voted out (9-4), 12 left. Randomly selected captains pick teams. 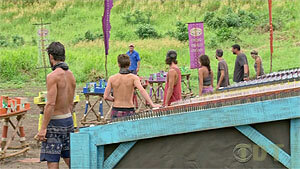 Purple team: Chris (captain), Bret, Ken, David, Taylor, Sunday; Orange team: Hannah (captain), Adam, Will, Zeke, Jay, Jessica. Four people (all but Taylor, Sunday, Hannah, Jessica) race through an obstacle course, retrieve a key, unlock a box, pull the box under a net (mostly Chris), then open the box to throw five bolos over a target (all Taylor). Purple wins cheeseburgers, fries, cocktails at a resort. 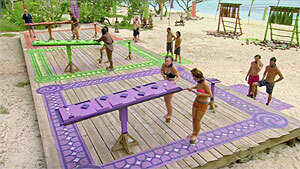 Ep9 RC: "All Mixed Up" - Purple team wins. As in South Pacific. Zeke and Will sit out to eat grilled ham and cheese, chips, and drink beer (soda for Will). Order of elimination: Rd.1: 10.Hannah. Rd.2 (narrower beam): 9.Bret. Rd.3 (narrowest beam, up to 20 min): 8.Jessica, 7.Sunday, 6.David, 5.Chris, 4.Adam, 3.Jay, 2.Taylor, 1.Ken wins! Ep9 IC: "Bow-Diddley" - Ken wins. TC9 - Taylor voted out (7-4-1), 11 left. Jay sits out after losing the draw for teams (despite David's offer). 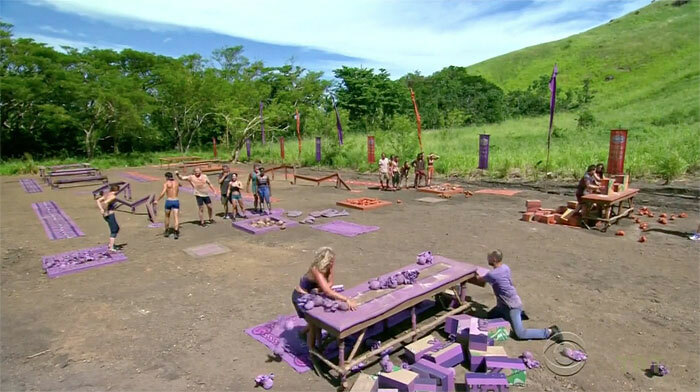 Orange (Chris, Ken, Jessica, David, Will) vs. Purple (Hannah, Sunday, Adam, Zeke, Bret). 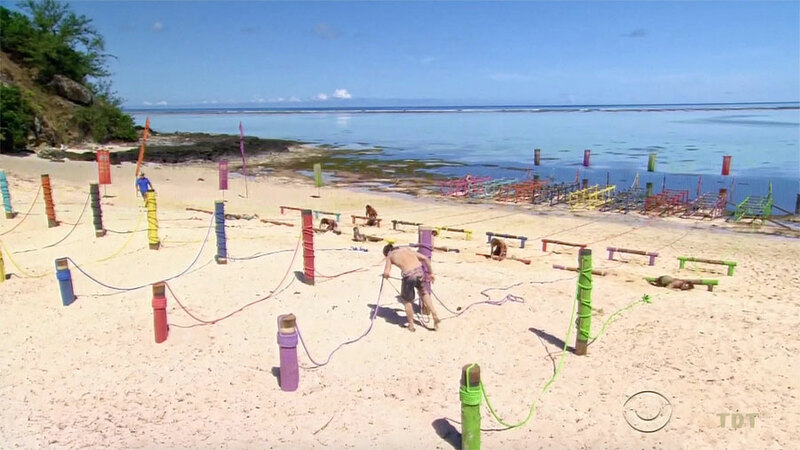 Each team must pull their raft to a dock, then one at a time, climb a structure, grab a key, slide down a pole, run the key to the beach. 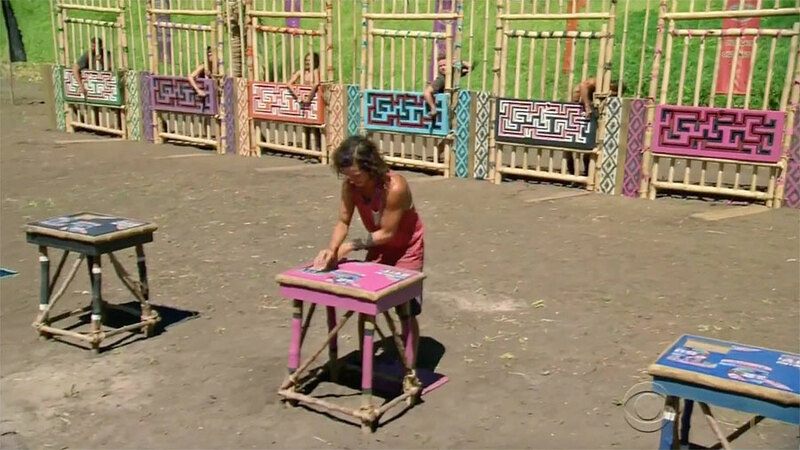 When all five arrive, they unlock the five locks on the puzzle, do the four-color cube puzzle from Samoa. 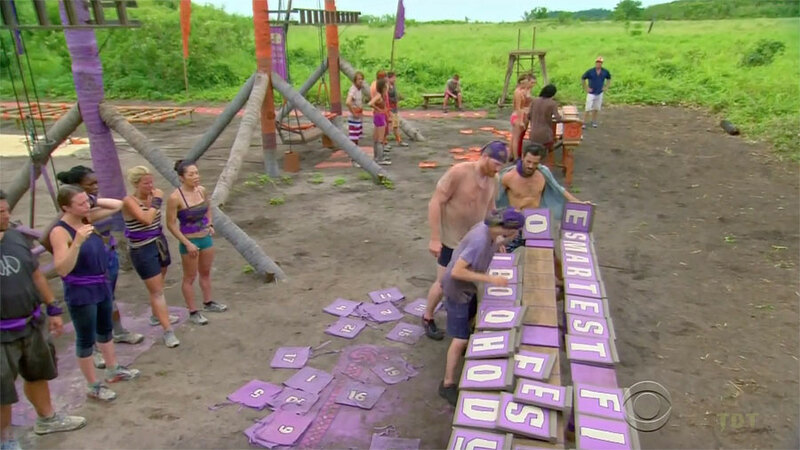 Adam, Zeke do the puzzle for purple, Chris, David for orange. 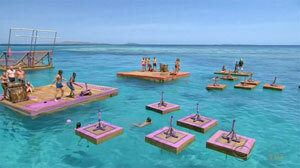 Orange blows the lead on the puzzle, purple gets a floating pizza party docked just off-shore from camp. 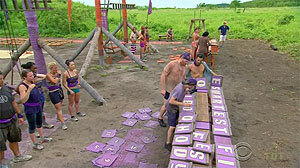 Ep10 RC: "Ferryman" - Purple team wins. 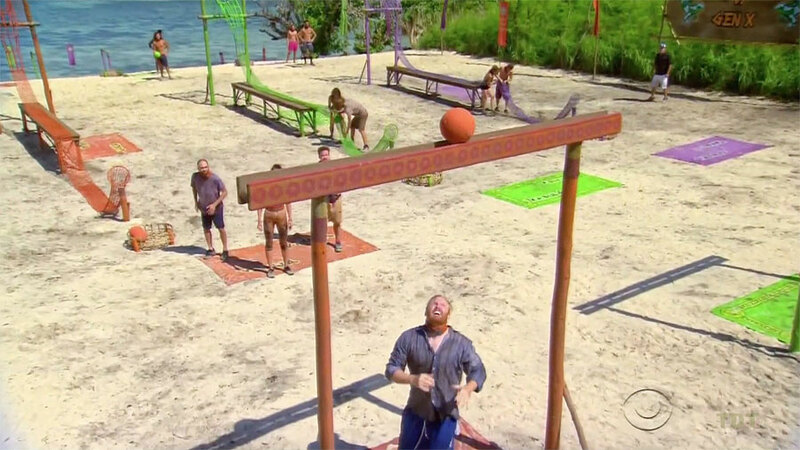 Ep10 Ep11: "Million Dollar Gamble (pt.2)" Ep12: "About to Have a Rumble" Ep13: "Slayed the Survivor Dragon"
Standing on a balance beam, each contestant must use a long pole to hold a statue on a tilted rail. In 5-minute intervals, contestants must move further back, making the pole longer, and the beam narrower. (By the fourth round, all are at the full, 10-foot pole length.) Order of elimination: Rd.1: All safe. Rd.2: 11.Hannah, 10.Ken. Rd.3: 9.Sunday, 8.Chris, 7.Will, 6.Jay, 5.Bret. Rd.4: 4.Adam, 3.Jessica, 2.Zeke, 1.David wins! Ep10 IC: "With a 10-ft. Pole" - David wins. TC10 - Chris voted out (7-4), 10 left. 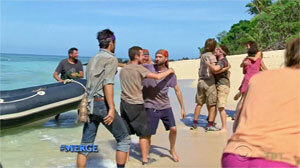 Teams of three, with the randomly unpicked person (David) automatically getting to join the reward. Teams are Orange (Sunday, Bret, Zeke), Green (Ken, Will, Jay) and Purple (Jessica, Hannah, Adam). 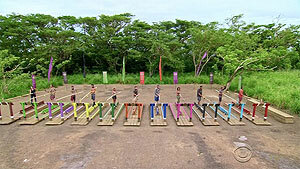 Contestants have feet shackled together and hands tied to their waists. They must wriggle through the sand to the next teammate. Once the third person reaches the finish line, all unshackle and solve the snake puzzle from Philippines. Green is first to the puzzle, purple dead last to reach it, but orange passes green, and wins a helicopter getaway to a feast on the beach. Ep11 RC: "Slither Me Timbers" - Zeke, Bret, & Sunday win. Contestants must perform a jailbreak by guiding a a key through a vertical table maze they can't see, followed by a simple 3x3 slide puzzle. Jay exits first, immediately solves puzzle. Jay wins, everyone else tied for second. Ep11 IC: "Rusty Cage" - Jay wins. TC11 - Jessica rocked out, 9 left. Before the challenge, the loved ones are introduced: Sunday's husband, Jeff; Bret's dad, Don; Jay's sister, Melanie; Hannah's mom, Liz; Adam's brother, Evan; David's dad, Doug; Ken's brother, William; Zeke's dad, Sam; Will's mom, Irene. They all sit and watch while the challenge runs. 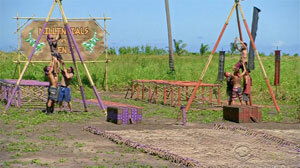 As originally seen in Tocantins, contestants are attached to a rope twisted over and around obstacles. Jay, Ken, Zeke lead most of the challenge, 1. Jay wins. 2-tie: Ken, Zeke, Hannah, David are all at the last post. 6-tie: Adam, Bret, Will are stuck on the crawl under a log. 9. Sunday last, station before that. Jay & Melanie enjoy BBQ at camp; Jay picks Will, Sunday, and Adam (and their loved ones) to join him. Adam gives the reward-steal advantage to Jay. Ep12 RC: "Rope A Dope" (loved ones visit) - Jay wins. As originally seen at the Nicaragua merge IC. 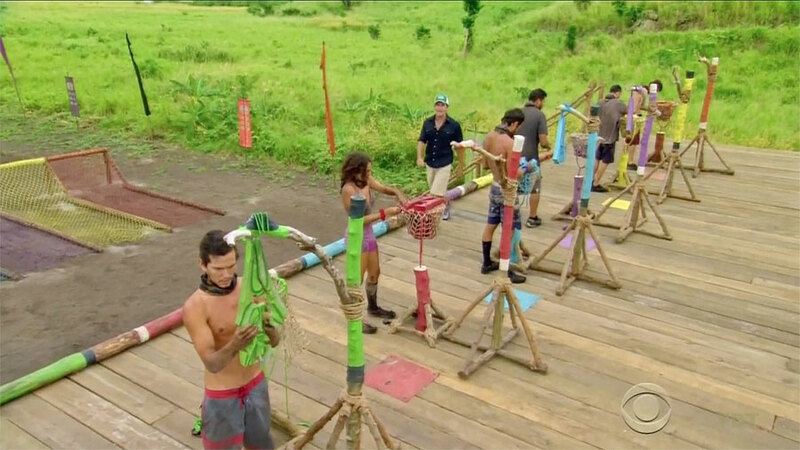 Contestants must hold up a metal rod by pulling outward (or pushing in, but that's dumb) on two rings. If it drops, it smashes a plate, and they're out. Except David, who somehow misses the plate. Elimination order: 9.David, 8.Hannah, 7.Will, 6.Bret, 5.Sunday, 4.Zeke (all quickly); at 4 minutes: 3.Ken, 2.Jay, 1.Adam wins! 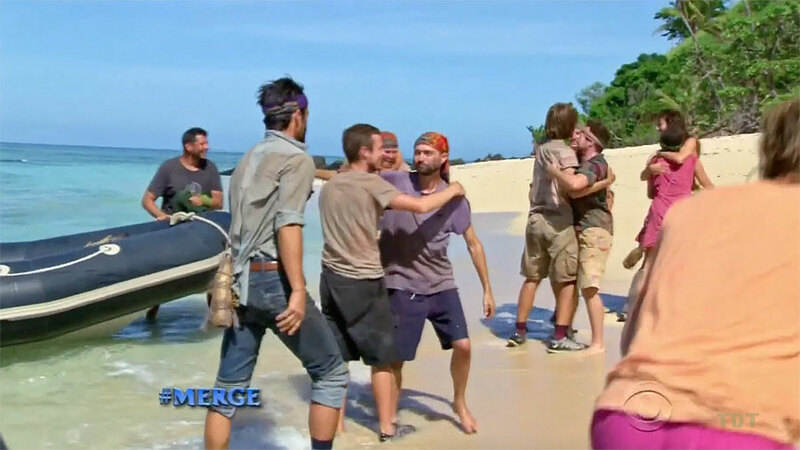 Ep12 IC: "Push Me Pull You" - Adam wins. TC12 - Zeke voted out (5-), 8 left. 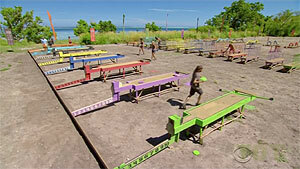 Contestants must move 10 discs across an obstacle course. Phase 1: stack discs on a vertical pole, carry them over a balance beam without dropping any. Phase 2: Stack them on a horizontal staff, carry them through a wire maze to a table. Then all 10 discs must be rolled vertically through a slot at the end of the table. Scoring: Jay-6, Bret-2, David-2, Jay-7,8,9,10. Jay wins! Rest are stuck on the final phase when Jay wins. Ep13 F8 IC: "Wizard's Staff" - Jay wins. TC13 - Will voted out (6-2), 7 left. 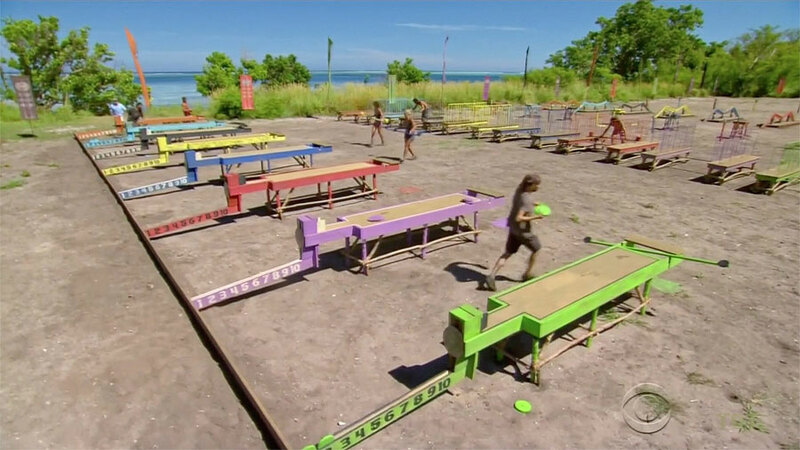 Contestants must roll a ball up a 'pinball table' with nails sticking out of it (as bumpers), and while the ball is rolling down, complete a puzzle. 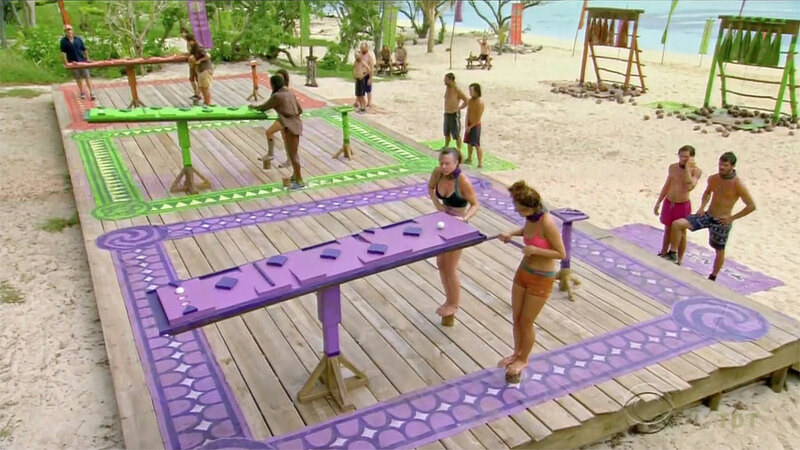 If the contestant catches the ball before it exits the table, they can roll it back up and continue. If it drops onto the track below, they must wait for it to slowly roll all the way to the bottom before continuing on their puzzle. David, Jay, and Ken initially lead on puzzle. Ken thinks he's solved it, is wrong. He continues, and Adam drops out to watch Ken's ball, ensuring David and Jay don't win. Eventually, Ken does. Ep13 F7 IC: "Pinball Wizard" - Ken wins. TC14 - Sunday voted out (4-2-), 6 left. Contestants must cross a series of obstacles, retrieve a bag of tiles, use numbers on those tiles to solve a combo lock. This releases a key, which they take under a net, then climb up to a platform, unlocking puzzle pieces, then finally solving a hanging bat puzzle. Jay is first to the puzzle, but leaves his combo uncovered, allowing everyone else to copy his answer and catch up. David wins. Ep14 F6 IC: "Tower of Power" - David wins. 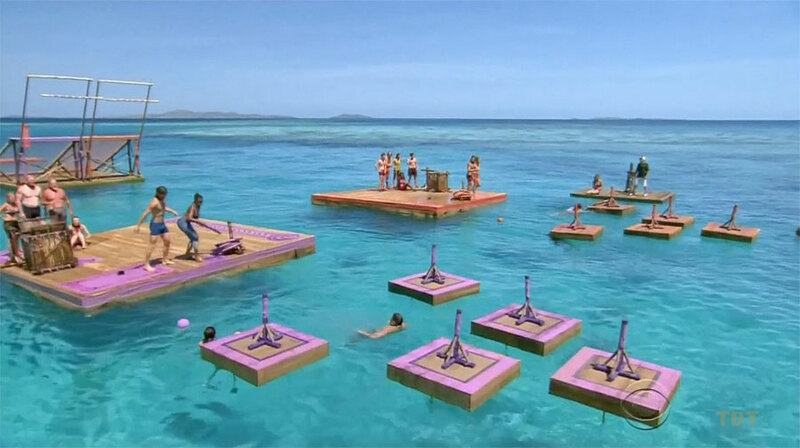 Starting in the water, contestants must move a buoy along a rope to the shore, then grab tiles between two handles, cross a teeter totter, and move all the tiles to puzzle table, where they then solve a word puzzle. Ken wins. Adam has all but the final word (NOT A PARTICIPATION TROPHY). Ken first, Adam second, rest tied for third. Ep14 F5 IC: "Draw the Line" - Ken wins. 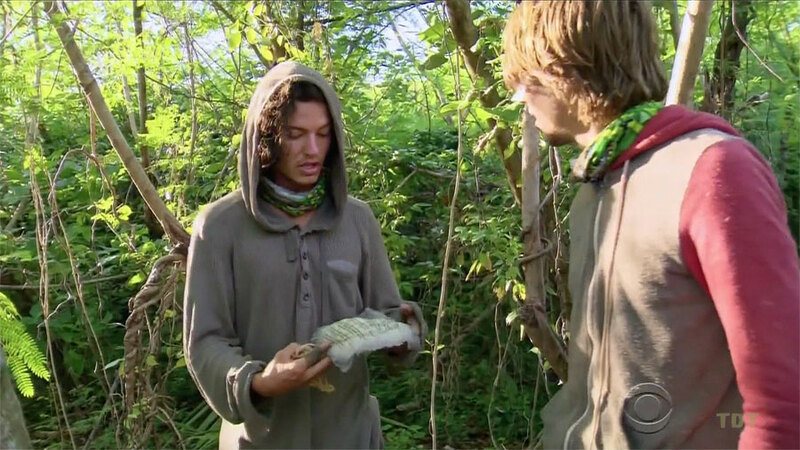 Searching after the immunity challenge, Adam comes across another hidden immunity idol, guaranteeing him safe passage to the Final Four. TC16 - Bret voted out (3-2), 4 left. Stacking bowls after moving them through a vertical wire maze on a spring, as in the F4 IC from One World. First to successfully stack 13 bowls, or whoever has the most after 30 minutes, wins. David, Hannah, Ken, then Adam all drop their stack as Ken gets to 12 bowls. All start over. As times expires, Hannah & Ken have 10, Adam 8, David 7. (Ken was going for #11). Then there is a 5-minute playoff between Hannah and Ken. Ken wins, 7-6. Ep14 F4 IC: "Operation Balance Build" - Ken wins. TC17 - David voted out (3-1), 3 left. Adam sweeps the jury vote, 10-0-0, over Hannah and Ken.